This is the BEST fried chicken recipe I have ever made! Crispy and juicy! Just like the Southern fried chicken you have always loved but Keto friendly! 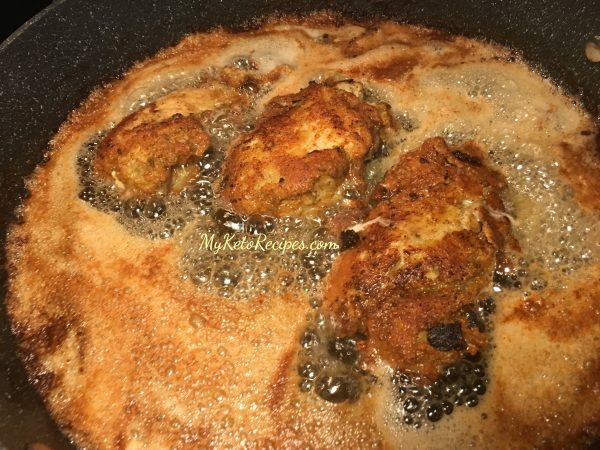 Just like KFC – Keto fried Chicken – But Better! 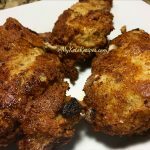 This low carb southern fried chicken recipe was a huge hit in our house! The chicken turned out perfect! My kids said it tasted just like Kentucky Fried Chicken or KFC chicken, but keto style! It was crispy on the outside and juicy and full of amazing flavor on the inside! 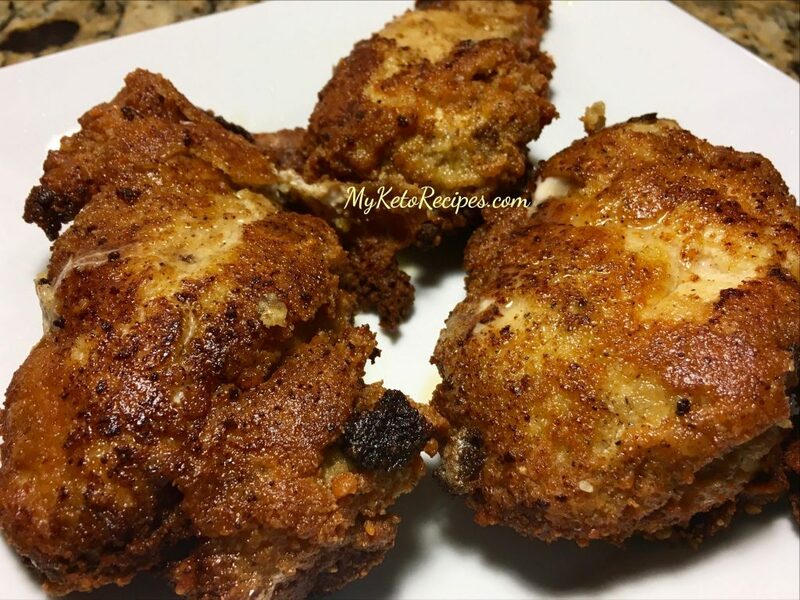 This is the best fried chicken I have ever made and the best part of it was that it was low carb and Ketogenic friendly! The kids LOVED this chicken and everyone asked for seconds! This has definitely become a favorite on our healthy menu because it’s so easy to make and we really enjoy it! My family loves following a ketogenic lifestyle and making all these amazing meals that are so healthy and so delicious! Everyone especially loved this meal. We enjoyed this with keto friendly Cabbage Steaks, which were also so unbelievably good! Definitely a perfect combination of fabulous keto friendly food! This would also go great with Cauliflower Rice for an amazing and complete meal! Cheicken is one of those foods that goes great with so many of our healthy side dishes. I love making Ketogenic meals and drinking Keto OS because I feel fantastic every single day! I am never sick anymore and my immune system is strong. I have so much energy and mental focus, I am always happy and I love feeling this way! My life has changed so much in the past two years thanks to Pruvit and my new ketogenic lifestyle! See more Keto/os lifestyle changes ->> HERE! Cut up chicken breasts into 3 even sized pieces and place into a bowl. Mix garlic powder, celery salt, chili powder and dried oregano, and coat chicken with mixture. Let sit for 20 minutes. In a separate mixing bowl, combine the almond flour and powdered parmesan, then pour onto a plate to bread chicken. Dip each piece of chicken in the egg mix and the roll in the almond meal and parmesan mix. Set aside on a plate until ready to fry. Heat up oil in a frying pan, then place chicken in to fry. Chicken should fry for 5-6 minutes per side or until it reaches a dark golden brown. If you are unsure whether the chicken is cooked you can use a meat thermometer to check for doneness or cut chicken to see if it is done. Love southern fried since I am from the south! How is it carb friendly when you fry it in oil and you can see the oil laying on top of the chicken pieces? That means the chicken pieces are greasy. I don’t like eating grease. If you don’t like it don’t make it! But i think you are a little confused on what carbs are. What kind of oil do you fry it in? Looks delish… will make tonight… Oh i love Keto………………. Looks delish can’t wait to try. Question you didn’t post Macros per piece of chicken, could you do that please.